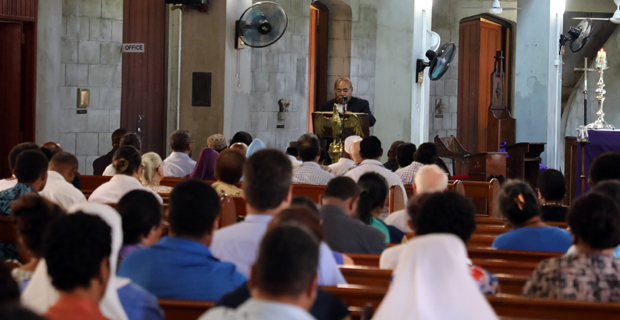 Multiculturalism and unity was evident when people from all races and religions gathered today at the Holy Trinity Cathedral in Suva in remembrance of the victims and their families that fell prey to the terrorist attack in Christchurch. The Fiji Council of Churches held a vigil by lighting 50 candles representing the 50 innocent lives that were lost. While speaking at the service, Acting Prime Minister and Attorney General Aiyaz Sayed‑Khaiyum says that hate will only stereotype the mindset of people, engaging them in inhumane acts like the one this terrorist has done. In order to achieve peace, it has to start from ones own self in their own religion as no religion promotes discrimination and violence. He also talked about the behaviour of the gunman that killed 50 people in Christchurch. The candles gave 50 more reasons to respect all nations, love and protect each other including the power for the fallen victims’ families to heal from the wounds and restrengthen themselves. While speaking at the vigil, Religious Adviser of Fiji Muslim League Mufti Mahboob Sher Khan says why Muslims are blamed for terrorist attacks as no one talks about religion or race when a sick patient needs blood. Khan says to stand against discrimination means to teach children to love one another, tolerate other cultural believes, respect other religions and move away from the mindset of cultural superiority. He says hate will create nothing but stereotype and dehumanize a person. The local churches with dignitaries from New Zealand are encouraging people to stand in solidarity, promote peace and harmony and say no to violent acts.